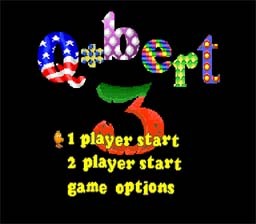 Play Q* Bert 3 Now! Q Bert 3 is an awesome game. It's just like the first one, except the graphics and sound are better. The levels are a lot cooler, too. Q Bert was huge when it first came out, but after a while the buzz about it just kinda died down. It's still an awesome game. The controls on this version weren't the same as they were on the NES. If you are used to playing the NES version, this one will take some getting used to. Q Bert 3 is an awesome game, so give it a try! Jump on the blocks to change them to the desired color. Watch out for enemies! Use the d-pad do make Q Bert hop in the desired direction. If you go to the options menu, you can set them how you want. Try not to use your flying discs unless you have to, if you finish the level without using them, you will get bonus points.